Despite the substantial interest in landscape genetics from the scientific community, learning about the concepts and methods underlying the field remains very challenging. The reason for this is the highly interdisciplinary nature of the field, which combines population genetics, landscape ecology, and spatial statistics. These fields have traditionally been treated separately in classes and textbooks, and very few scientists have received the interdisciplinary training necessary to efficiently teach or apply the diversity of techniques encompassed by landscape genetics. To address the current knowledge gap, this book provides the first in depth treatment of landscape genetics in a single volume. Specifically, this book delivers fundamental concepts and methods underlying the field, covering particularly important analytical methods in detail, and presenting empirical and theoretical applications of landscape genetics for a variety of environments and species. 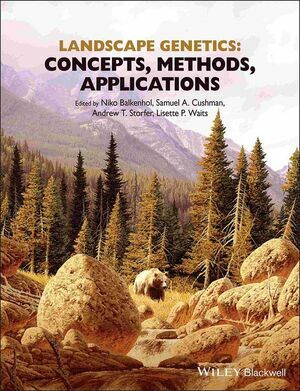 Consistent with the interdisciplinary nature of landscape genetics, the book combines an introductory, textbook like section with additional sections on advanced topics and applications that are more typical of edited volumes. The chapter topics and the expertise of the authors and the editorial team make the book a standard reference for anyone interested in landscape genetics. The book includes contributions from many of the leading researchers in landscape genetics. The group of scientists we have assembled has worked on several collaborative projects over the last years, including a large number of peer reviewed papers, several landscape genetics workshops at international conferences, and a distributed graduate seminar on landscape genetics. Based on the experiences gained during these collaborative teaching and research activities, the book includes chapters that synthesize fundamental concepts and methods underlying landscape genetics (Part 1), chapters on advanced topics that deserve a more in depth treatment (Part 2), and chapters illustrating the use of concepts and methods in empirical applications (Part 3). This structure ensures a high usefulness of the book for beginning landscape geneticists and experienced researchers alike, so that it has a broad target audience. At least one of the four co editors is involved in almost every chapter of the book, thereby ensuring a high consistency and coherency among chapters.